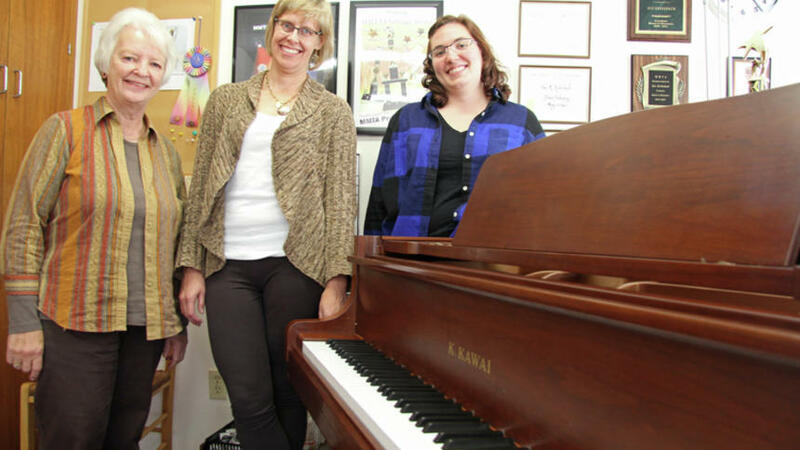 By Scott Wente on Oct 25, 2017 at 9:59 p.m.
Sue Krebsbach and Carol Sailer each was teaching piano at home nearly 30 years ago when they wanted to "be a bit more professional," Krebsbach recalled. They decided to share rental space in St. Paul Park beginning in 1990. Before long, an adult student asked if they would get a flute teacher because there weren't others in the area. "That's basically how we started," Krebsbach recalled. "(We had) no intention of ever starting a music studio." Yet, K&S Conservatory of Music was born. "Cottage Grove and St. Paul Park were our first customers," Krebsbach said. "Then we started getting people from Woodbury and that's when we started thinking about expanding." They opened a second location in Woodbury's Seasons Market development in 1994. The area's growing population was a factor in their expansion, but so too were school budget cuts that took away time for one-on-one music lessons in school. As a result, more students turned to private lessons. In 1999, K&S landed at its current location at 1976 Wooddale Drive in Woodbury, where the 20-room studio is led by Krebsbach and fellow directors Sue Ruby and Sarah Mensen. While they started by expanding from piano to flute, now about 35 instructors cover piano, brass, woodwinds, percussion, strings, guitar, bass, composition and voice — everything but accordion and harp. Piano remains the main draw, followed by voice and guitar. K&S has students ranging in age from 4 to 91. Most students are in elementary school and middle school. Most of the roughly 500 students are youth; they have about 30 adult students. They also started offering an early childhood music program called "Music for Little Sparrows," an introduction to the piano and other instruments. Teaching individual music lessons has changed over the years, said Ruby, who like Krebsbach and Mensen specializes in piano. More students nowadays want the "quick fix." "It's a different kind of motivation, a different speed of learning," she said. "It's very individualized instruction because that's what they like." Students' preferred musical selections also have changed over time. "You have to be working with so many different types of music — not just classical," Krebsbach said. Now it ranges from classical to popular music to the songs used in video games. And it's not just flipping pages in a piano book; cellphone and tablet music apps are used in lessons by some of the instructors. Also, K&S has eight recital dates a year, and they have started to incorporate student art and more audience participation into the recitals. They have seen other changes in private music education over the years. Demand for strings instruction has increased as School District 833's orchestra program has grown. Also, students are involved in more and more activities, leaving less time for music instruction and practice at home. Ruby suggested parents encourage their children to practice their instrument at home and listen to them play. She wants them to "make it more of a priority." K&S instructors are independent contractors who specialize in the instruments they teach. They set their own rates. The three K&S directors said they work hard to pair students with teachers based on instrument interest, personality and availability. Krebsbach, Ruby and Mensen run the studio but still sit down with students at the piano. "One thing that makes us different, we're directors here but we're also teachers here," Mensen said. "So we're invested in not just the business side but the education side as well." The overarching mission of K&S Conservatory of Music is to instill in its students an "enjoyment and appreciation of music," Krebsbach said. "The overall goal is that they can still play the piano when they're an adult," added Mensen. Ruby added that they hope to create "a music lover that will support the arts" by playing music, attending concerts and performances, and supporting art and music programs. They value the impact they can have. Krebsbach previously taught music in a school classroom, but found individual teaching more rewarding. "It's a very unique opportunity to get to know these people and influence their lives," Ruby said.